A study (conducted by Hyperfish, Sharegate, and Nintex) found that 50% of organizations still use manual processes to enforce SharePoint governance. It doesn't have to be this way! New Office 365 capabilities allow you to automate important governance activities and core business processes. How do you make SharePoint and Office 365 deliver value as an intelligent information management platform? That's what we sought to find out when we first contacted SharePoint expert, Rob Bogue. Rob basically eats, breathes, and sleeps SharePoint, so we knew he'd be the perfect one to work with. Are you finding yourself overwhelmed by the amount of data you have to manage? While it's great to stay up with the latest technology, digital transformation can sometimes leave people feeling like there was a document "explosion" in their department. Not to worry, we're here to help. It's hard to overestimate the impact of SharePoint on the information management market. Since its humble beginnings in 2001, it has grown to nearly 200 million seats and is found in every industry sector. If you're reading this blog post, you likely have SharePoint in your organization. But SharePoint can't magically make your information more accessible. There is no SharePoint fairy that assesses all your information, uploads just the valuable stuff to SharePoint, applies appropriate access controls, and fills in the metadata. In fact, most organizations with SharePoint aren't particularly satisfied with it - through no fault of SharePoint or its capabilities. Rather, there are two main issues. "The World Turned Upside Down" is an English ballad, first published in the middle of the 1640s to protest the policies of Parliament relating to Christmas. Parliament believed the holiday should be a solemn occasion, and outlawed traditional English Christmas celebrations. Fans of the musical Hamilton will recognize the tune in another context. After Battle of Yorktown in 1781, “The World Turned Upside-Down” was the song played by the British band as the British and Hessian troops marched out to surrender, the last major battle of the American Revolution, signifying the end of the British era in the Colonies. In 2007, SharePoint began the long process of turning the world of ECM – Enterprise Content Management – upside down. This is what the ECM landscape looked like in 2007: The focus was on automating content intensive, complicated, mission-critical processes within departments at very large organizations. Think check processing in banking, or forms processing in insurance, or the new drug application process in pharmaceuticals. Solutions were complex, custom and expensive and purchased by business buyers. And most importantly, solutions were difficult to use and required LOTS of training. But that really didn’t matter because “users” were limited to a handful of “documents” and “records” and “process” specialists within organizations. Up until 2007. While it was technically released at the end of 2006, in 2007, SharePoint (Microsoft Office SharePoint Server 2007, or ‘MOSS’) began to redefine the ECM industry around general knowledge workers rather than document “specialists” and leveraged Microsoft’s presence with IT staff. The ECM industry was in the process of being turned upside down, although at the time few realized it. In the early days of SharePoint MOSS, I asked a group of leading ECM providers what they thought about SharePoint. The almost universal response was, “Well, I don’t know what SharePoint is doing, but it isn’t what we do.” After about a billion dollars in sales in what seemed like record time, the ECM industry recognized that the world had indeed been turned upside down, and ECM players refocused around working with rather than against SharePoint. The important thing to remember in the context of the current changes going on in the ECM space is during the first phase of the revolution, the frame of reference was still “traditional” ECM – content intensive, complicated, mission-critical processes within departments at very large organizations. We tried to force all of that unruly and ad hoc knowledge worker content into a “traditional” ECM frame. We tried to do this by putting additional content management solutions on top of SharePoint. Knowledge worker content was still somewhat of an afterthought to supposedly “real” ECM content. The fundamental assumptions for how we viewed content management remained those of “traditional” ECM. The bias within the broader ECM community was still focused on those who needed to record content rather than those who need to work with content on a daily basis. Fast forward to 2017. After a decade of radical change in consumer, mobile, and cloud technologies, we are on the cusp of a second revolution, one that truly will turn the content world upside down. Forrester’s division of the content space into Transactional Content Services and Business Content Services reflects the revolution that is underway. Forrester believes that transactional content drives high-volume customer-focused processes. In my terminology, this is the world of “traditional” ECM. This is separate and different from business content. Business content “includes familiar formats such as office documents, spreadsheets, email, and multimedia. The content may be formal (with structured templates or forms) or informal (created ad hoc)” and is directly tied to the experience of knowledge workers on a day-to-day basis. Businesses are looking for people-centric, simple processes allowing for a balance between personal management capabilities and organizational management requirements. It is here that the future of content management is being defined. Microsoft defines the stages of a modern content strategy as follows: Create -- Create, collect, and share the documents you need to get your work done. Coordinate -- Structure your teamwork and work together, using co-authoring, metadata, groups, taxonomy, and collaborative tools. Protect -- Manage compliance and reduce risk with life cycle management, information architecture, auditing, rights management, and eDiscovery. Harvest -- With efficient enterprise content services, use analytics to drive discovery, gain more control over content, and take more attuned actions which lead to better decisions. While the Create/Coordinate/Protect/Harvest terms are Microsoft terms, they do reflect eight fundamental forces of disruption that are turning ECM upside-down once again – for real this time. The user experience in creating and sharing content is central to every follow-on content stage. Documents and content must be “born” managed – with fundamental content management metadata baked in at creation rather than bolted on. Metadata driven policies are increasingly critical to guide a piece of content from creation to archive and disposition and how it is throughout this lifecycle. Increasingly complex – and often contradictory – industry, legal, and government requirements increasing the need for a coherent information governance strategy. Organizations are demanding on premise, cloud, and hybrid solutions that work interchangeably. Privacy and security strategies are being redefined around what a document is rather than being based upon the devices upon which it is viewed. Users are demanding the ability to disaggregate content capabilities and to be able to buy and consume content management capabilities by the drink rather than buy the gallon. Process owners want to control how day-to-day processes are automated, and organizations want sanity and consistency in how this is done. All of which points to yet another upside-down flip in the content management space. This time, it’s a revolution truly originating with the needs and requirements of individual knowledge workers. It is also a revolution that I think will ultimately redefine not only the world of business content, but also how transactional content is managed. 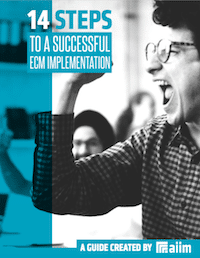 Reevaluating traditional “legacy” ECM implementations in business content terms – rather than the other way around – will ultimately turn the ECM world upside-down. ----- Interested in the Current State of Information Management? Get an Executive Summary of our latest market research study - free!